Nanotechnology and targeted delivery have emerged as unique strategies for improving therapeutic efficacy while minimizing toxicity and off-target effects. Targeted nanocarriers can be used to deliver novel drug candidates and to provide new formulations of matured therapeutics. Multivalent-engineered nanostructures also hold the possibility to deliver combination therapeutics.1-3 There are several nanotech-based drugs already launched and hundreds of new targeted treatments under development. Genisphere’s 3DNA® joins the list of targeted drug delivery nanoreagents, including by broad definition, liposomes, quantum dots, gold nanoshells, micelles, magnetic nanoparticles, dendrimers, and carbon nanotubes. While a variety of polymeric materials are used to manufacture these nanocarriers, Genisphere’s 3DNA nanotechnology platform is DNA-based and is composed of a cross-linked network of uniquely designed DNA strands.4 Looking to expertise in both Pharma and Academia, Genisphere has been leveraging a collaborative model to advance several drug delivery programs, and is also progressing its own lead compounds based on the 3DNA platform. 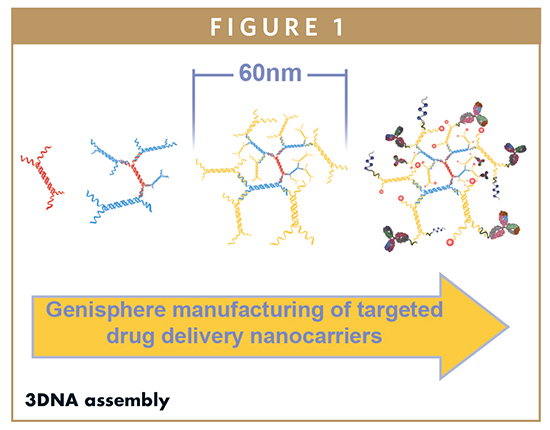 Genisphere routinely manufactures therapeutic quantities of drug delivery nanocarriers called 3DNA. The manufacturing process is intended to consider the need for nanocarriers with a truly modular design. Like other nanoreagents, 3DNA is constructed using materials, in this case, DNA, that are not new to the FDA. Specifically, Genisphere uses seven unique sequences of single-stranded DNA designed to hybridize to one another to create building block monomers, each with a central double-stranded region and four terminal single-stranded regions (Figure 1). By design, it is possible to manufacture five unique monomers. The monomers themselves hybridize to each other in specific orientations, due to base-pairing between complementary single-stranded regions. For assembly, monomers are hybridized and crosslinked to each other in a step-wise fashion of forming layers (Figure 1), and a two-layer core 3DNA nanoscaffold with a diameter of 60 nm is typically used for drug delivery applications. Importantly, crosslinking during manufacturing ensures the stability of the core 3DNA structure, providing a shield from the harsh physiological environments often found in vivo. Genisphere has functionalized 3DNA with a variety of targeting devices and drug cargoes, depending on the intended use. Therapeutics successfully conjugated to 3DNA include small molecules, proteins, peptides, miRNA, siRNA, mRNA, and plasmid DNA. Typical targeting devices are selected based on an up-regulated marker on the cell of interest, and include antibodies, antibody fragments, peptides, sugars, vitamins, and other targeting devices. Like other nanocarriers, 3DNA uses targeting devices to ensure specificity and minimize off-target drug effects. 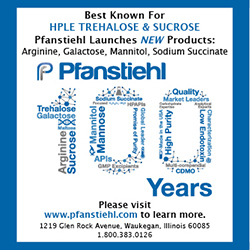 Similarly, sustained-release formulations are possible to manufacture, by modulating attachment chemistry, using PEG or other stealth molecules, or incorporating into a hydrogel formulation. DNA as a nanotechnology matrix offers a unique set of physical, chemical, and biological properties.5,6 Because 3DNA is completely and only made of DNA, it is soluble, biocompatible, and biodegradable into non-toxic material, with a metabolic clearance pathway already known to the host organism. Given its unique properties, structural flexibility and solubility, 3DNA is not really a nanoparticle, but rather a nanocarrier. Using DNA offers versatility in assembly and control of the physical size or shape of the nanocarrier. 3DNA is uniformly negatively charged, and is designed with a base composition to avoid activation of the immune response typically characterized by cytokine production and up-regulation. Biodistribution, accumulation at desired site, and clearance are only determined by 3DNA targeting moieties, not by the core structure. 3DNA has hundreds of drug attachment sites that can allow lower doses to achieve the same efficacy as free drug when the appropriate targeting moiety is selected. In addition, 3DNA is completely customizable for targeting or multi-targeting with two or more unique moieties per single nanocarrier. This flexibility in multivalency enables delivery of a targeted combination therapeutic to, for example, engage the immune system while delivering a cytotoxin to disease cells. Because there are many options for conjugating DNA to drugs, 3DNA enables delivery of a broad range of drug compounds. Multiple linker chemistries can be used in the same construct, enabling differential drug release. Importantly, two or more different drugs may be coupled to the same 3DNA molecule, in both the core and also on the periphery, further maximizing the therapeutic payload. In mouse and rabbit models, no toxicity has been observed at therapeutic dose levels or after chronic treatment of various 3DNA formulations. Throughout the course of these studies, all animals appeared healthy, demonstrated normal behavior, and showed no signs of toxic effects nor change in body weight due to the administration of the 3DNA nanocarrier. Immunocompetent mice demonstrated little to no cytokine activation 0.5-48 hours after systemic administration of 3DNA nanocarriers. Both deep sequencing and PCR have been used to show 3DNA nanoscaffolds are degraded after cargo delivery in vivo, with no impact/integration to target cell genome. To study biodistribution using radiolabeled antibodies, mice were injected with either radiolabelled anti-ICAM antibody, or a 3DNA targeted against the same radiolabeled anti-ICAM antibody. The animals were sacrificed, organs were excised, and isotope was counted and compared to determine the presence of control antibody versus targeted 3DNA. 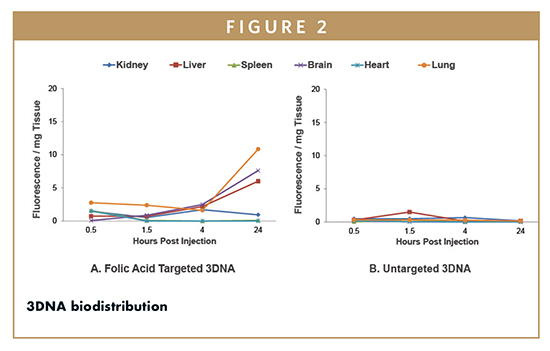 Interestingly, only the liver showed similar distribution between the two delivery systems, while kidney, brain, spleen, heart, and lung showed higher presence of 3DNA, suggesting 3DNA did not accumulate in the liver like other nanoparticles. Of particular note was the 3DNA crossing the blood-brain barrier in mice. In another simple biodistribution study (Figure 2), folic acid-targeted, Cy3-labeled 3DNA was compared to untargeted Cy3-labed 3DNA (no drug cargo was used). Various organs were collected immediately prior to sacrificing the mice at specific time points post injection. Samples from non-injected animals showed minimal levels of auto-fluorescence and no nanostructure-like fluorescence, as expected. Untargeted 3DNA nanocarriers did not accumulate in tissues, while targeted 3DNA nanocarriers accumulated only in tissues expressing the folate receptor. Specifically, 3DNA nanocarriers with folic acid attached as the targeting molecule bound to specific cells in the brain, liver, and lung within 4-24 hours following injection. Genisphere pursued a collaboration with Dr. Janet Sawicki at the Lankenau Institute for Medical Research to demonstrate functional in vivo delivery of a cargo molecule. 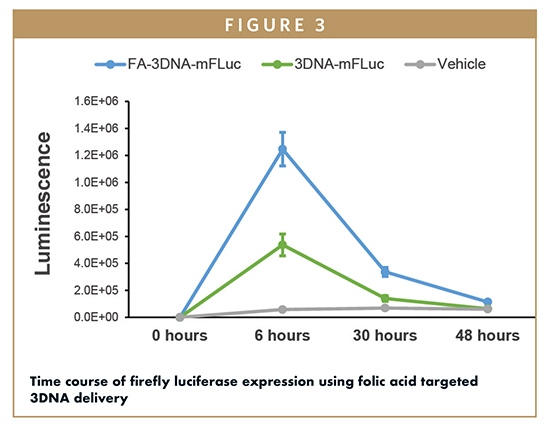 Specifically, commercially available luciferase mRNA was combined with a specially designed 3DNA containing folate as a targeting molecule (FA-3DNAmRNA). The 3DNA was designed to bind the mRNA via a sequence within the mRNA itself. As a control, untargeted 3DNA with luciferase mRNA (3DNAmRNA) was also prepared. Each of the formulations as well as vehicle were intraperitoneally injected into mice bearing orthotopic ovarian tumors. At various time points, the animals were imaged for bioluminescence to determine the relative luciferase expression over time (Figure 3). Based on the imaging results, the ovarian tumors were the only observable targeted tissue, maximal mRNA expression occurred 6 hours after injection, and targeting was required for efficient delivery. Untargeted 3DNA demonstrated minimal luciferase expression, further supporting the requirement for targeting and the overall lack of an EPR dominant effect. Cataract surgery is one of the most common procedures performed throughout the world, but it is not without complications. While surgery restores vision in the majority of cases, up to 40% of adults and most children develop a secondary cataract, a vision-impairing condition called posterior capsule opacification (PCO). Laser treatment is required to correct PCO, but it is expensive and can be risky. Genisphere’s therapeutic candidate GL-249 has been designed as a quick and easy treatment to prevent PCO at the time of cataract surgery, by immunodepleting the cells that cause PCO. The specific cells in the eye that contract and produce wrinkles leading to PCO can be targeted by a unique monoclonal antibody. This antibody is used as a targeting device on 3DNA loaded with doxorubicin, a cytotoxic drug, and the resulting GL-249 formulation has been studied in mouse and rabbit models. Rabbits aggressively develop PCO 4 weeks after cataract surgery, and in one study, GL-249 reduced the incidence of the condition in rabbits compared to controls when delivered at the time of cataract surgery.7 Further development of sustained-release formulations may lead to a quick and easy method to prevent PCO at the time of cataract surgery, and open the door to treating other serious conditions of the eye. In a preliminary study, ovarian tumor-bearing mice were injected with untargeted Cy3-labeled 3DNA or with Cy3-labeled 3DNA with either folic acid, anti-transferrin receptor antibody, or antifolate receptor antibody-targeting moieties. The animals were sacrificed, and various tissue sections were prepared and viewed to confirm the expected biodistribution of targeted 3DNA. The targeted Cy3-3DNA was observed in the center area of the tumor, with little staining in the stroma, while untargeted Cy3-labelled 3DNA did not localize to the tumor. To assess if the various targeted Cy3-labeled 3DNA were directed to the tumor via macrophage uptake, ovarian tumor sections were labeled with F4/80 antibody to detect macrophages. Macrophage staining was observed in cells in the stroma and adipose tissue (when present), and a few single cells in the tumor demonstrated little co-localization with the Cy3-labeled (3DNA targeted) tumor cells. Because no dual-labeling was observed, it is believed the presence of targeted, Cy3-labeled 3DNA observed in the tumors is not due to macrophage uptake and is a result of true targeting. To test delivery of a small drug molecule, mice bearing ovarian tumors derived from ID8-Fluc bioluminescing cells were systemically injected twice a week for 3 weeks. The injected formulations included the cytotoxin doxorubicin, delivered as free drug or delivered using folate-targeted 3DNA. 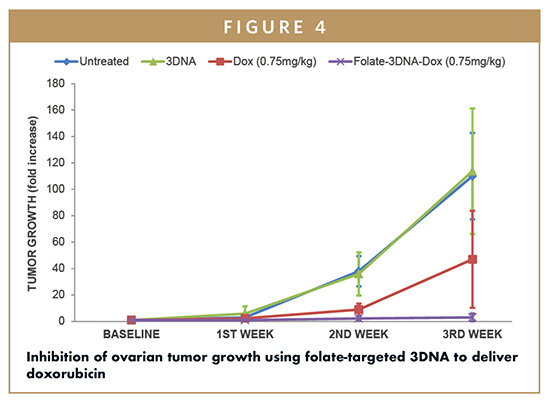 At the end of the short study, it was observed doxorubicin delivered with folate-targeted 3DNA significantly hindered ovarian tumor growth compared to the same dose of free doxorubicin (Figure 4). A similar mouse ovarian tumor model was used in a study using folate-targeted 3DNA formulations to deliver siRNA (lead candidate GL-233).8 Human antigen R (HuR), also called ELAVL1, is an RNA-binding protein that regulates the expression of genes known to function in tumor cell survival and in drug resistance. A double-stranded siRNA to HuR was designed with modified RNA bases for stability, and an extension of 23 ribonucleotides on the 3’ end of the passenger strand for hybridization to single-stranded peripheral portions of 3DNA. In this case, mice bearing ovarian tumors derived from ID8-Fluc bioluminescing cells were intraperitoneally injected twice a week for 4 weeks. Both tumor growth and ascites development were reduced in animals treated with 3DNA reagents compared to control formulations. 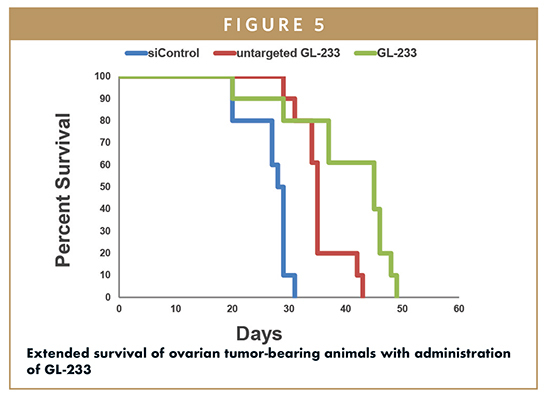 A follow-up study (Figure 5) of the folate-targeted siHuR 3DNA (GL-233) showed extended survival of mice treated with GL-233 (49 days) compared to control animals (31 days). GL-233 is being investigated as a complementary approach to current, active therapies for ovarian cancer for overcoming drug resistance and inhibiting tumor growth. Genisphere’s 3DNA platform is composed entirely of noncoding DNA assembled through the sequential hybridization of single strands of DNA into a network of double-stranded nucleic acid having a controlled architecture, and multiple attachment sites for drug and targeting molecules. The flexibility of the 3DNA platform enables targeted delivery applications in gene delivery, biologics, small molecules, and RNAi therapeutics. Through collaboration and on its own accord, Genisphere has advanced several 3DNA-based lead compounds, and seeks additional partnerships for development of clinically relevant programs. For example, Genisphere recently announced a collaborative research agreement with the University of Pennsylvania for photodynamic therapy (PDT), in which 3DNA specifically targeted to breast cancer cells will be used to deliver photosensitizing drug. PDT is a complementary treatment option for early stage cancer. After tumor tissue is surgically removed, photosensitizing drugs are administered and activated by visible light to destroy any remaining cancerous cells. The delivery of PDT to the entire surgical field is essential, thus selective photosensitizer accumulation in diseased cells is necessary to avoid therapy-limiting damage to normal tissues. On the industrial side, Genisphere recently publicized a research and option to license agreement with MedImmune, the global biologics research and development arm of AstraZeneca. The partners will develop 3DNA nanocarriers using up to six of MedImmune’s oncology molecules. Genisphere continues to explore utility of 3DNA in versatile applications. 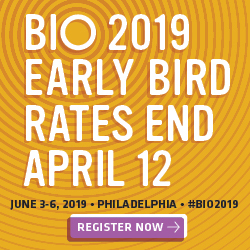 Future areas of interest include CRISPR gene-editing strategies for oncology and neurotherapeutics based on multi-targeted 3DNA nanostructures. With the emergence of new translational tools in medicine and the growing need for individualized care for patients, the 3DNA platform provides just the right amount of flexibility to rapidly adapt to patient needs while maintaining high therapeutic efficacy and little to no toxicity, ultimately enabling both individualized care and combination therapy. 1. Bottini M, et al. Targeted nanodrugs for cancer therapy: prospects and challenges. J Nanosci Nanotechnol. 2014;14(1)98-114. 2. Frank D, et al. Overview of the role of nanotechnological innovations in the detection and treatment of solid tumors. Int J Nanomedicine. 2014;9:589-613. 3. Sanna V, et al. Targeted therapy using nanotechnology: focus on cancer. Int J Nanomedicine. 2014;9:467-483. 4. Nilsen TW, et al. Dendritic nucleic acid structures. J. Theoretical Biology. 1997;187:273-284. 5. Getts RC, Muro S. DNA-based drug carriers: the paradox of a classical “cargo” material becoming a versatile “carrier” to overcome barriers in drug delivery. Current Pharmaceutical Design. 2016;22(9);1245-1258. 6. Muro S. A DNA device that mediates selective endosomal escape and intracellular delivery of drugs and biologicals. Advanced Functional Materials. 2014;24:2899-2906. 7. Gerhart J, et al. Reducing posterior capsule opacification by eliminating myonog cells using 3DNA nanocarriers and the G8 antibody. Poster presented at The Association for Research in Vision and Ophthalmology annual meeting, May 2015. Available at: http://genisphere.com/sites/default/files/Reducing%2520Posterior%2520Capsule%252Opacification%2520by%2520Eliminating%2520MyoNog%2520Cells%2520Using%2523DNA%2520Nanocarriers%2520and%2520the%2520G8%2520Antibody.pdf. 8. Huang Yu-Hung, et al. Delivery of therapeutics targeting the mRNA-binding protein HuR using 3DNA nanocarriers suppresses ovarian tumor growth. Cancer Research. 2016;76(6);1-11. 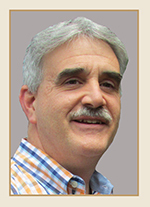 Robert C. Getts, PhD, is the Vice President of Research and Development and CSO at Genisphere. Since joining the company 22 years ago as a Senior Research Scientist, he has actively developed outside relationships with project collaborators and potential partners in the biotech research and business communities for work on original and custom products and technologies. He has led the development of Genisphere’s 3DNA nanotechnology and IP portfolio as a signal amplification platform for improving sensitivity in life science and diagnostic assays (for microRNA and mRNA) and more recently as a pre-clinically validated targeted delivery platform for cancer, cardiovascular, and central nervous system indications. Dr. Getts has over 25 publications to his credit and continues to publish peer-reviewed manuscripts and review articles. He has more than 15 issued patents domestically and internationally and more than 35 submitted patent applications internationally. In recent years, Dr. Getts has been focused on drug discovery and the pre-clinical development of Genisphere’s 3DNA platform for both Genisphere and partner pharmaceutical company Lead candidates, leading to the development of an extensive dataset in support of this work. Jessica Bowers is the Marketing Director at Genisphere. Since joining the company in 2002, she has supported product launches, provided technical and sales support to a global base of customers, and guided corporate communications. 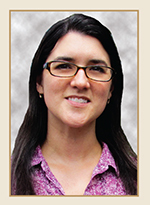 She serves as project coordinator for Genisphere’s collaborations with academic institutions for targeted drug delivery.